Nothing says “I love you” like a heart cut solitaire diamond pendant. This romantic necklace will put a sparkle in her eyes and will last forever. 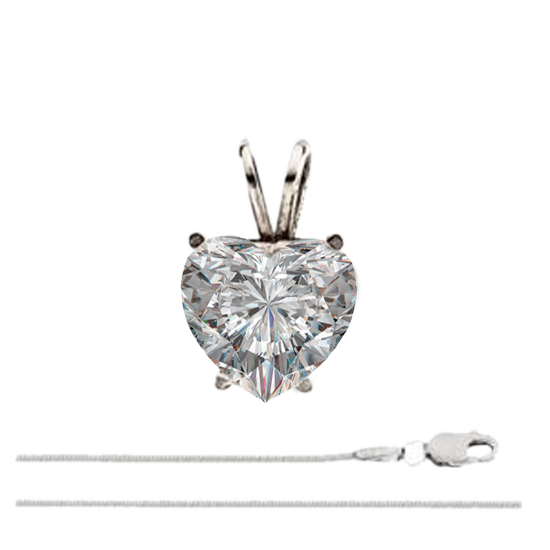 CaratsDirect2U offers a large range of 0.50 – 2.00 carat heart shape diamond pendants in a variety of colors and clarity. The chains for our heart shaped pendants are 16, 18, and 20 inches in length and are available in either a snake or rope style chain. This item is especially popular during Valentines’ season as well as for anniversary gifts. Heart diamond jewelry are also a wonderful year round surprise when you want to show you love for that special someone. Heart shaped diamonds are very romantic and can make a wonderful surprise and display of love for someone close to your heart. Our diamond heart cut pendants are set in four prong settings in 14k white gold, giving it a nice clean look that goes with any casual or elegant wardrobe. We also sell KM processed heart shaped diamond pendants.